HMS CENTAUR was one of four Centaur Class light fleet carriers. Laid down at Harland and Wolff yard in Belfast, Northern Ireland.at the end of WW 2 in 1944. She took nine years to complete. She was the first RN Carrier to have an Angled Flight Deck. 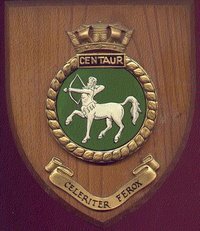 HMS Centaur was completed with a straight deck for the first sea trials in 1953, but immediatley after being accepted into the RN she was taken in hand for modification with a 5 degree angled deck similar to her two sisters Albion and Bulwark. Her 1966-68 refit was primarily to replace her Hydraulic catapults with Steam catapults. 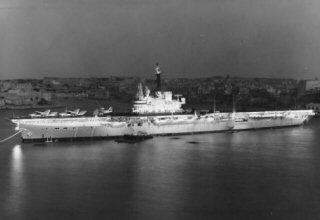 RN angled deck ops began in 1954 (Centaur, Albion, Bulwark and Hermes, joined by Ark Royal in 1955 and Eagle after refit in 1956). The angle deck was not a full angled flight deck. The Bow End was a painted safety line due to her small size. The Angled Flight Deck was a Royal Navy Invention, but it was the United States Navy that developed the concept. The Aircraft Carrier of 27100 tons, operating the angled deck in December 1952. USS Antietam (CVS 36) was the first angle deck Fleet Air Arm pilots had to continue with straight deck operations until 1954. 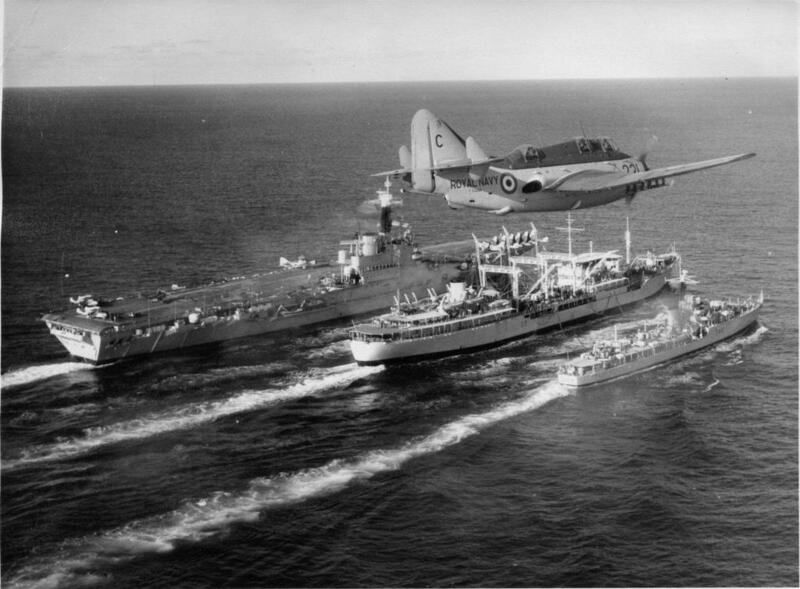 An interim painted angle flight deck was utilised for a while on HMS CENTAUR. These Deck Landing trials were conducted by Lt. Cdr. D. "Shorty" Hamilton. RN. in May 1954. Launched 22nd April 1947 and Commissioned 1st September 1953. She saw service in 1961 when three RN carriers were deployed to the Persian Gulf to protect Kuwait from Iraqi Annexation. Monday, 19 November 1962 . HMS Centaur, boiler room accident. The following crew died in tragic circumstances, from a release of Superheated Steam. 1965 saw her consigned as an accommodation ship for HMS VICTORIOUS which was under refit. 1966 saw her again as an accommodation ship for HMS EAGLE which was under refit. In 1970 she was towed to Devonport (Plymouth) wher she was laid up for two years. In 1972 she was towed to Scotland (Cairn Ryan) and scrapped. She was a small ship to take such a large aircraft as a Sea Vixen, displacing only 24000 tons.